A new setter this week or a known one in disguise. (For those of you that remember, the two previous April Fool Listeners were by Dolos, otherwise known as….) I assumed that there would be an April Fool theme here, although it may fool us by relating to the four 4s of the puzzle number instead. Nothing seemingly too difficult here, with four entries requiring modification before entry and nine others omitting one of the letters of the answer in the wordplay. Two other clues consisted of wordplay only. Finally, a load of highlighting and line drawing would be a potential trap for me. 10ac Comic character most frequently seen in Rupert Bear — art is foremost (6) used a device that I’ve seen elsewhere recently, and the letter R appeared three times. However, the rest of the clue remained a mystery. I decided to try the downs to see if that would help, and 1 PARLORS and 3 REEN should have assisted. However, since the A (of AMUSER) was omitted from the wordplay, I didn’t spot it. 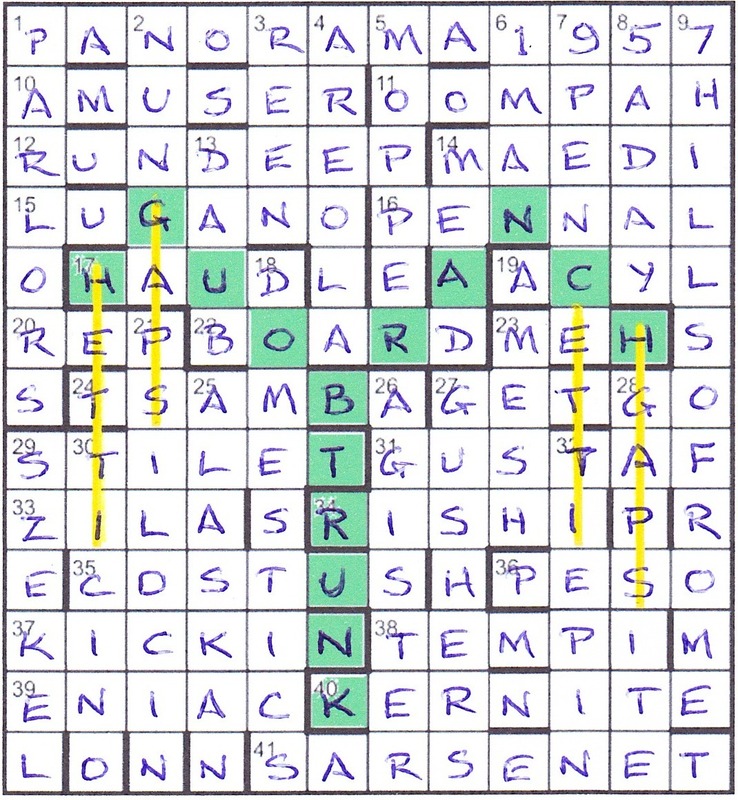 Another spate of solving, and 1ac looked suspiciously like PANGRAMMATIC, but then I hadn’t solved any of the down clues in the top right corner. Of course, when I realised that the words for numbers in 6, 7, 8 and 9 down, were entered as their digits to reveal 1957, all became clear. We were dealing with what was probably the most famous April Fool hoax of all, certainly in this country. Panorama in 1957 featured spaghetti trees! I don’t actually remember it as I was too young… certainly too young to be watching serious adult news programmes like Panorama or This Week. I was a bit unsure of my answer to 22ac Spenser perhaps penning old conversation of his (5) which I had as BOARD (O in BARD). It seemed to me that the entry in Chambers — board (Spenser, etc bord, borde, boord or boorde) — indicated that the Spenser word was not BOARD. However, 4dn was definitely AREOLA, so BOARD it was. Having already solved one of the wordplay-only clues to give LUGANO, I finally got the other one TICINO, a canton in Switzerland whose largest city is Lugano and where they grow spaghetti! All that remained was to locate the pasta-yielding tree. Its TRUNK was easy to find, near the bottom of column 6, and then the BOUGH and BRANCH out of the top. I then spent a bit of time wondering whether HETTICINO at the bottom of column 2 was one of required bits of pasta. Alas, there’s no such thing, but when I spotted SPAGHETTI in two halves up and down in columns 2 & 3 and 10 & 11 I knew I was home. Four vertical lines were required and I spent more time wondering exactly how they should be drawn. They obviously had to go through the letters of the pasta, but they also had to make contact with the tree, especially in the case of the line in column 10. All in all, just over two hours for this, so thanks for a thoroughly entertaining solve, Handyman. This entry was posted on 21 April 2017 at 4:00 pm	and is filed under Solving Blogs. Tagged: Food For Thought, Handyman. You can follow any responses to this entry through the RSS 2.0 feed. You can leave a response, or trackback from your own site.